Front row, back of the house, VIP seats and everything in between - every seat in a theater has its pros and cons, which can often make the audience experience in one part of the theater very different from the experience in another. That experience also depends on who you are seated next to, in front of, or behind. For an epic musical like Les Misérables, now appearing in a powerful regional production directed by Brian Kite in the 1251-seat La Mirada Theatre for the Performing Arts, I experienced what it was like in the extreme house right section of the audience about six rows back. From that vantage point, the magnificent ballads and rousing choruses sung by a large cast packed with gifted singers never suffered a beat. In fact, Claude-Michel Schönberg’s music is incredibly well-served by the formidable cast no matter where you sit and, for that reason, this “stand and sing” musical deserves every bit of the praise it is sure to receive. Also on the plus side; sitting house right and this close to the stage makes it very easy to let the nuances of the actors’ performances affect you at a deep level. 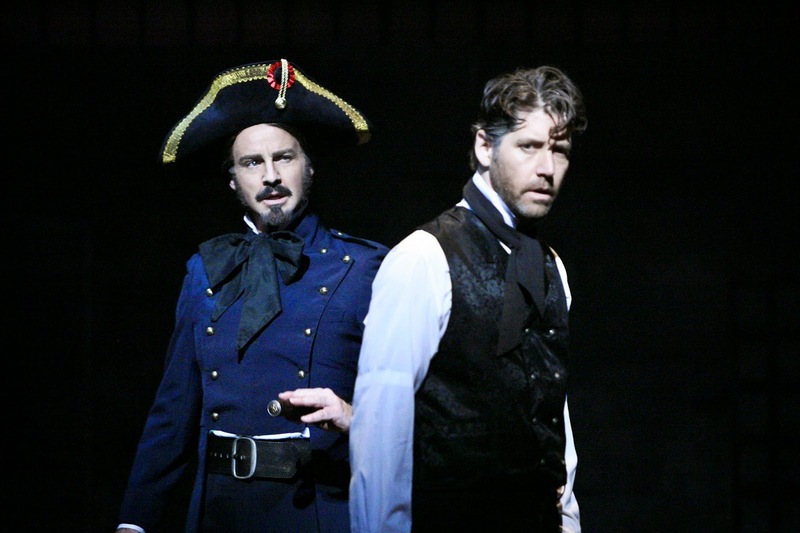 The stellar work done by James Barbour in the role of Jean Valjean is especially obvious here as he is often blocked downstage center and has some choice scenes down left (house right) as well. Barbour is a force of nature as the thief cast aside by a system of justice that turned its back on him for stealing a loaf of bread to feed his sister’s starving children. A man changed by years in prison, it is one of a handful of roles that offers an actor the opportunity to show what really lives inside him and just how deep he can reach. In Barbour’s case, it is a well that appears to be bottomless. This actor can do it all. 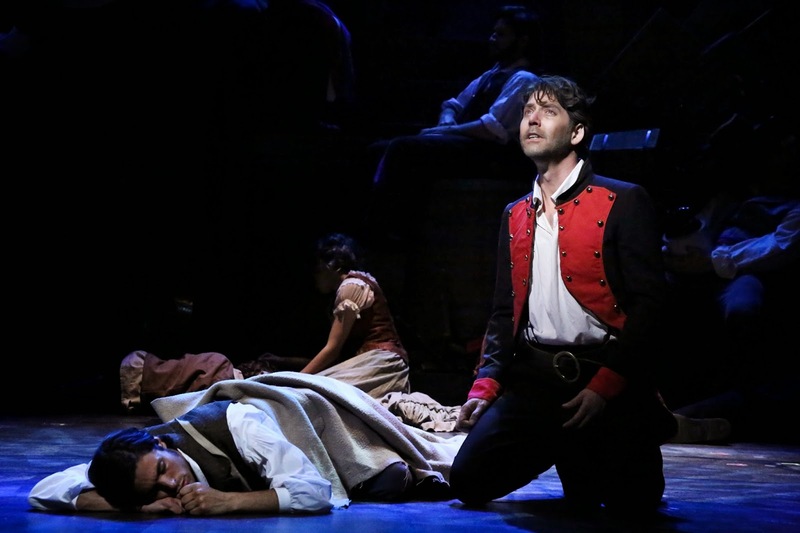 When you see Les Miz, let’s face it, one of the things you hope for is a Valjean who can sing the incredibly challenging part – I mean really sing it – and Barbour is, hands down, the best I’ve heard. Searing high notes full of concentrated emotion soar over the orchestra, and if his floating pianissimo falsetto at the end of “Bring Him Home” doesn’t make you want to jump out of your seat and explode into instantaneous applause, I’ll be very surprised. Opening night’s audience could barely contain itself. What you lose sitting extreme house right six rows back however is visual perspective. Anything that happens upstage left is hidden from view and the magical effects created when seen from the front reveal their secrets when the same scene is viewed from the side. This is where sitting center or further back comes in handy. 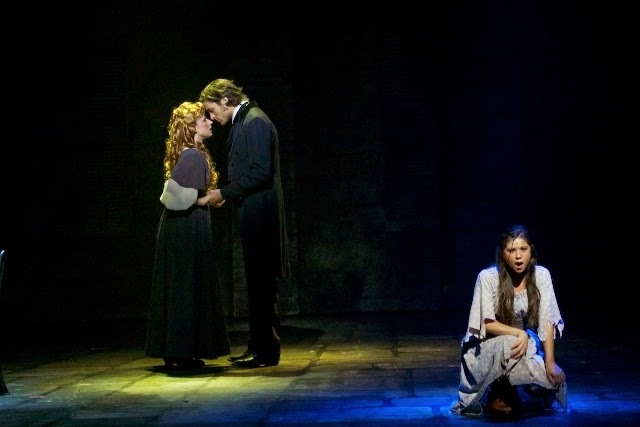 In these seats, lighting changes and body placement create heartbreaking moments, such as when Fantine’s (Cassandra Murphy) beautiful hair is cut on stage as a last desperate attempt to earn money but, from the side, all you see is her wig being removed by another actor. And when Javert (Randall Dodge, best when singing in full voice rather than clipping his notes) steps over the railing to plunge to his death, lighting changes and a rapidly flown out railing create a falling effect that is quite stunning. When seen from the side and closer up however, all you see is a flimsy prop rail that rocks back and forth until it is pulled up above him. 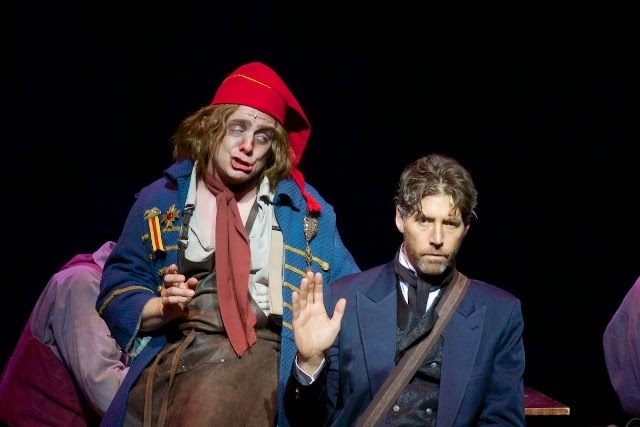 Jeff Skowron, as Thénardier, makes great use of the full playing area in “Master of the House,” prancing hilariously around the stage and including everyone in the audience in his demented antics. Looking like a walking cadaver, he is very much the picture of 19th century Beetlejuice, singing with a growling character sneer in his voice and adding a healthy measure of comic relief to everything he does. He knows what’s funny and has the timing to prove it. Sound designer Josh Bessom inserts a particularly effective underground echo for Skowron in the sewer scene that enhances the immediacy of time and place. Valerie Rose Curiel’s creamy voice gives a lovely new color to the role of Éponine and Anthony Federov (Enjolras) spurs the students on to revolution with passionate intensity and American Idol-class pipes. 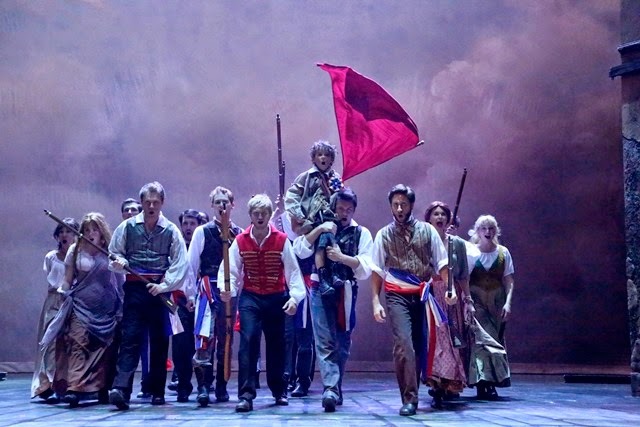 Two skirmishes outside the barricade build upon the driving anthem begun by the ensemble during the Act I finale propelling the action forward to its inevitable conclusion. Nathaniel Irvin’s (Marius) standout number is the “Café Song,” better known as “Empty Chairs at Empty Tables,” a haunting dreamlike sequence filled with the ghosts of dead soldiers. With so much testosterone-laden political dissent loose on stage it is also terrific to hear the ensemble women featured in “Turning” with individual solo lines that reveal an excellent collection of voices. They add an underlying richness to the choral sound so beautifully integrated with the men by musical director John Glaudini. Potent and sweepingly epic in the scope of its story and depth of emotional vulnerability, Les Misérables stands in a class by itself. It is well-suited to La Mirada Theatre’s assets and though it will be a different show depending on where you sit, you’ll still be rewarded with an unforgettable experience.